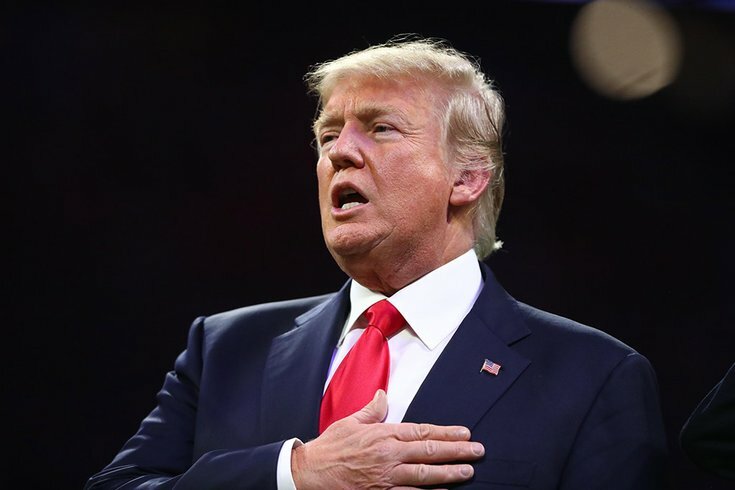 President Donald Trump sings the national anthem before the 2018 CFP national championship college football game between the Alabama Crimson Tide and the Georgia Bulldogs at Mercedes-Benz Stadium in Atlanta. s weekend to attend the Army-Navy game at Lincoln Financial Field. The game, scheduled for 3 p.m. Saturday, Dec. 8, has been traditionally attended to by sitting presidents Trump was at the game in 2016 when he was president-elect. The most recent sitting president to attend the Army-Navy game was President Barack Obama in 2011, when it was held in Landover, Maryland. Saturday's game, the 108th football game between the Army Black Knights and the Navy Midshipmen, will be the 20th with a president in the stands, beginning with Theodore Roosevelt's attendance in 1901. If Trump follows tradition, he will switch sides of the field during halftime in a show of equal support for both military academy teams. Trump last visited Philadelphia in early October, when he went to the Pennsylvania Convention Center for the National Electrical Contractors Association. The October visit was met with hundreds of protestors in Center City, many adopting the newly unveiled Gritty as a symbol against the president.